Anyone who instructs children understands that, in addition to teaching the subject matter, a teacher must also set the emotional tone. Likewise, youth coaches must provide both instructional and emotional leadership. In practices and games, you will sometimes need to emotionally pull your players in the direction you want. Here are some of the ways in which you do this. Come to each practice ready to set the appropriate intensity level. Your body language and tone of voice should communicate that you are prepared and ready to go. This will help put your players in the right state of mind and lead to a productive practice. Your practices and instruction must successfully mix the right amount of structure, competitive activities, individual and team instruction, fun, and the opportunity to simply run and expend energy. Much like understanding the flow of game situations and the movement of players on the field of play, you will need to understand and react to your players, adjusting the pace and nature of your practices. At times you will have to raise your voice, at other times lower it. You may need to shorten your verbal instruction when your players seem less focused. You will sometimes need to send your players to the end line to run “suicides” or sprints, to blow off energy and restore some control to your practice. And there will be other times when you must recognize that your players are in a more childlike state of mind; they're giggling, laughing, and enjoying some unstructured moments of fun. Quiet yourself and let this dynamic flow for a few minutes. As you gauge and react to your players’ emotional state, respond with actions that establish the energy level you want. But also recognize that there are times when you will need to loosen the reins. Always try to remove any negative emotion or cynicism that may have found a place in you from the frustrations of your daily life. You want to stay positive, be hopeful, and always show that you believe in your kids and their ability to improve. Although I generally had great youth coaches, here's one example of the opposite. After an extremely successful first year in Pony League baseball under the guidance of an excellent baseball coach, my second year was far less enjoyable. One of the changes included a new coach. This gentleman was not especially knowledgeable about baseball; he was also disabled, walking with a severe limp. I have no idea whether his disability or the other events of his day affected his outlook on life, but I distinctly remember sensing a cynical, less hopeful attitude when he came to our practices and games. I also recall the resulting negative effect it had on my attitude and that of my teammates in that forgettable season. Finally, recognize that your attitude is reflected in all aspects of your coaching behavior, including how you conduct yourself in game situations. When players see you yelling at the referee, they start yelling at the referees. Avoid improper language. Do your best to set a good example and correct your players should they mimic your mistakes. If you genuinely enjoy coaching your sport and your team, the attitude of your players will reflect your enthusiasm. Give your players the benefit of both instructional and emotional leadership. Any recommendations for when you have a mix of kids at a mix of emotional places? I always find my sessions are a bit of a dance, letting them do some of the leading where I can. But recently I've had some mixed age sessions that present divergent mindsets and emotional messages. Any suggestions? In my experience (which is coaching mainly boys), the easiest groups to coach are ones where the kids are at practices because they enjoy playing the sport. Their joy of playing supersedes their individual egos and personal issues. They intuitively understand that sports is structured fun and that they need to share the play to have the most fun. They also want to learn how to become better players. The more challenging groups are the ones where individual personalities stand out. ADHD kids, drama queens, and the occasional kid who doesn't enjoy sports can all test a coach's patience. 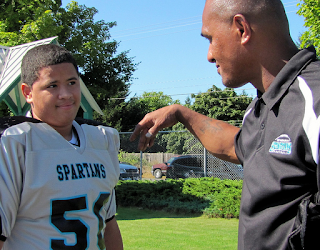 These kids tend not to respond as readily to a coach's enthusiasm and emotional leadership. Obviously, each of these kids is different and you need to try to find an approach that works. I had one ADHD boy who was constantly interrupting practices with questions. My solution was to tell him that he could ask one question per practice. Every time he started to ask a question, I said, "Darren, are you using your question?" He would pause, and then say, "No, not yet." He seemed to enjoy that game and was easier to coach from then on. Where possible, try to find each individual's path to success. But to come clean, I've also had other "problem" kids (and groups), where I didn't have an answer. Sometimes I try to hold the reins tighter and keep the practices moving. No dead-time—no opportunity to act out. Still, I've coached some youth teams where I eventually told myself, "Just get through the season." In these instances, I focused more of my effort on the kids who wanted to learn and become better players. Above all, I hope that the message of empathy and camaraderie brings about the dynamics of emotional interaction with youth teams. Bullying is considered as a failure for bringing about empathy and emotional leadership.